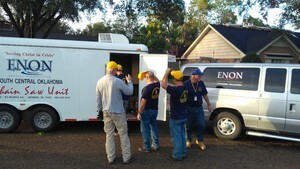 Most of the food distributed by the Red Cross during a disaster is cooked by Southern Baptist Disaster relief workers. The average age of a DR is said to be in the 70s. 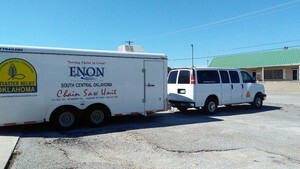 Oct 2017 ENON Baptist Association sent a 7-person team to Victoria TX with the Association Chainsaw Trailer. This was about 5 weeks after Hurricane Harvey made landfall in Texas. The number of meals that DR workers served to date was 13.4 million in just 5 weeks! 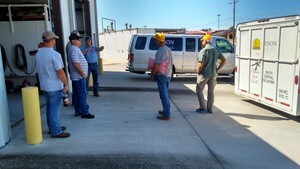 During our time there we were able to minister to people affected by Harvey, spread the gospel, and assist in debris cleanup. 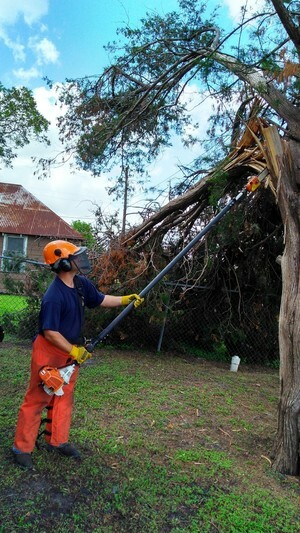 Debris cleanup included removing trees so that residents could gain safe access to their property. 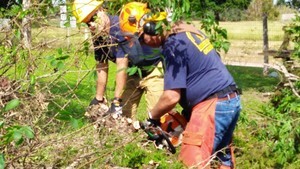 Chainsaw Team members were from ENON Association Churches including Milo Baptist Church, and Zaneis Baptist Church. We were housed at a local church in Victoria where we slept on air mattresses and cots. We worked long hours, had wonderful fellowship, and best of all - everybody came home with all their fingers and toes. There is opportunity for anyone to serve in DR ministry through BGCO. Oklahoma has a long history of assisting others when the need arises. Serving in DR is a blessing to those who chose to enter into this ministry, speaking from experience I can say that you take away much more than you bring when you deploy to assist. 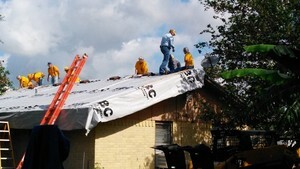 This opportunity to share the love of Christ has the potential for a huge impact in the lives of those affected by natural disasters, as well as those who come to serve. 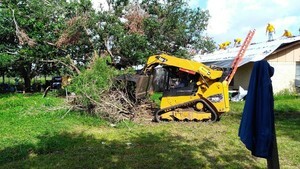 Debris removal with Skid Loader. Driver is Bill Jones from Milo. 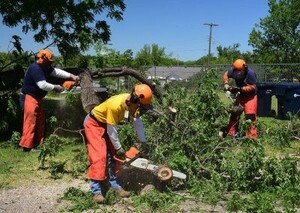 Chainsaw team doing what they do best. Boomer Hatfield using the pole saw.